An.nap.o.lis, noun. a small fishing village on the banks of the Naval Academy. Annapolis has been a very popular destination wedding city long before the current trend to head to the Caribbean or Mexico! Because many USNA Officers wish to be married in the splendor of the USNA Chapel, each year many brides and grooms flock to Annapolis for their destination wedding from across the globe. In addition to being the capital city of Maryland, Annapolis is also the county seat for Anne Arundel County. Getting a marriage license takes about 15 minutes at the courthouse. No worries about special rules and regulations sometimes encountered when marrying in a jurisdiction outside the United States, Annapolis is a perfect place for a destination wedding for many reasons. 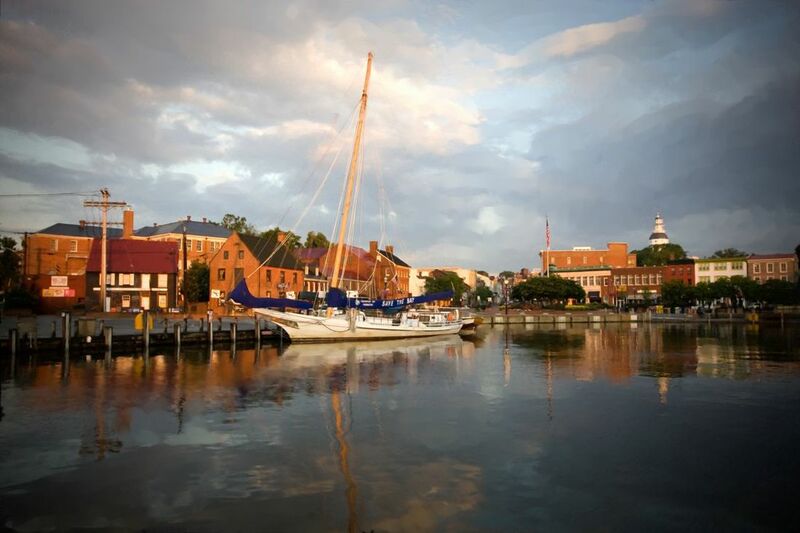 Annapolis is easily accessible by air, train or car. Baltimore Washington Thurgood Marshall Airport is a short 35-minute drive to Annapolis with many options for shuttle services. Reagan National Airport and Dulles International Airport are also options for flights to Annapolis. An Amtrak station is located very near BWI airport also provides shuttle service to most hotels with a reservation. ​Guests will feel like they are getting a bonus vacation. Whether your guests prefer beach, boating, history, sightseeing, art exhibits or sports, Annapolis offers these and much more. Delightful restaurants abound in Annapolis. Call Going to the Chapel… to start planning your Destination Annapolis wedding today!